Registrations for CanSkate are on-going and pro-rated, based on the date of registration. CanSkate is a dynamic learn-to-skate program for boys and girls with a focus on fun, participation and basic skill development. Professional coaches, assisted by trained program assistants, help skaters improve their basic skills, whether their focus is figure skating, hockey, ringette, speed skating or just skating for fun. Skaters will learn a complete series of balance, control and agility skills taught in a group format. 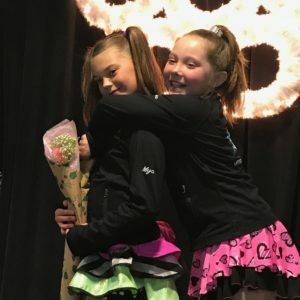 Each skater will progress at their own rate during active sessions with upbeat music, a wide variety of activities and a motivational environment that promotes learning. Skaters must be able to stand,fall and move on their own. Click here for more information about the CanSkate program. All you need are skates, a CSA-approved hockey helmet, long pants, mittens and a warm sweater or jacket. Dress in layers – it will get warm! 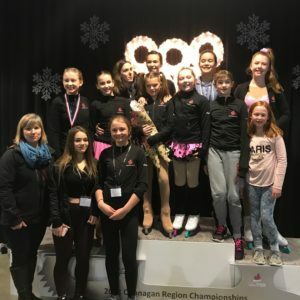 All skaters participating in Vernon Figure Skating Club programs are required to purchase a Skate Canada annual (September to August) membership/insurance fee ($36) as well as a club administration fee ($5 - $15 depending on your program). Our coaches are Carla Bryan and Schelley McRae in addition, we have volunteer Program Assistants who help on the ice. They are Vernon Figure Skating Club members picked for their dedication and leadership skills. They lead classes in the 'Fun Zone' as well as assist with our youngest skaters. We couldn't run the program with out them and we hope you appreciate the time and energy they bring to our program! a detailed breakdown of the skaters progress. Here is what you can expect your child to learn..
each coach, the 3rd station is the 'Fun Station' and is led by our trained PA's. I forgot my liability waiver, can my child still go out on the ice? volunteer board member will be available on the first day to collect forms and help answer any questions you have. Can I leave the Arena to go do other errands? equipment adjusted. We do not have the staff on hand to assist skaters with these needs. Will my child get a badge? listed at each badge level before the badge is awarded. The nice thing about the program is that 3 ribbons (Balance, Control, Agility) can also be earned at each badge level. 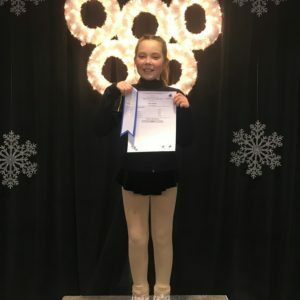 So if a skater has to repeat a badge level they will likely still be awarded with a ribbon as they may have mastered one of the 3 Fundamentals of that level. It does not do anyone any favours to move into a new level just for participation. Just like swimming, you may have to repeat a level. Every skater at every level will be challenged or introduced to a variety of skill development progressions. How can I give encouragement to my skater? How do I get my child's attention when on the ice? leave the ice they must ask permission first. What if my child is too scared and wants me to be with them on the ice? Unfortunately the CanSkate program is not a Parent and Tots class. You can explain to your child that "Grown-ups" are not allowed. This is "special time" for kids only. Due to safety and liability every person that steps on the ice must be registered as a Skate Canada member. We cannot allow parents in street shoes/boots or skates on the ice during CanSkate. We do have Program Assistants available to help children if they need a little more one on one attention during the first few lessons. How/When can I approach a coach if I have a question? You may also speak with one of our Board members; their contact info is posted at the top of the stairs. 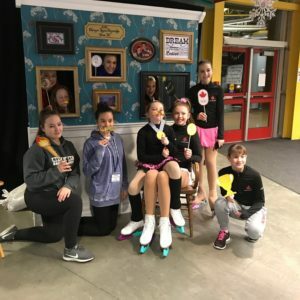 The Club CanSkate board, to the left of entering the arena, is a great tool for understanding what lessons will be taught for each of the badges and levels. You will also see a detailed breakdown of the skates progress. WE WISH YOU ALL THE BEST FOR A GREAT SESSION OF CANSKATE!